We take a look at all the games for round three of the WNBL Chemist Warehouse 2018/19 Championship, team by team. Sitting mid table with one win and two losses, the Lightning will be looking to halt their streak of two losses when they host top of the table Bendigo Spirit. Nia Coffey leads the team with 44 points and 33 rebounds for the season so far, her round one effort of 19 points and 15 rebounds earned a WNBL team of the week nomination. One of Lightning’s most complete performers in these early stages has been Nicole Seekamp, with 36 points, 14 rebounds and 10 steals, so look for her to try and break Bendigo’s spirit. The undefeated Spirit are away for their two games this round. Perth Lynx are first up followed by the Lightning on the return trip. American import Rebecca Tobin has been one of the highlights for the Spirit heading into this round. New recruit Barbara Turner joins the Spirit this week, and the American looks to parter up with good friend Nat Hurst in the back court. After winning two NCAA championships with the Connecticut Huskies women’s basketball team, she’ll be hoping to replicate that success at the Spirit. If fatigue doesn’t become a factor, the Spirit could find themselves 4-0 at the end of the round. Third on the ladder with two wins and one loss, the Rangers have had their ups and downs so far. The fourth quarter fightback to win against the Sydney Uni Flames was one for the highlight reel. Off-season recruit Bec Cole led the charge that game with 21 points and four rebounds, and she’ll be crucial for the Rangers to get the win at home over the Lynx. In her first season since crossing over from Bendigo Spirit, Betnijah Laney is putting together a strong early campaign. Her 41 points, 25 rebounds, 16 assists and 5 steals shows why the Rangers brought her in to compliment their line up. Talls Kayla Pederson and Tayla Roberts will shoulder the load on the inside and look to release their running players on the fast break. The Deakin Melbourne Boomers scored their first win of the season after taking advantage of an injury-hit Sydney Uni Flames unit. 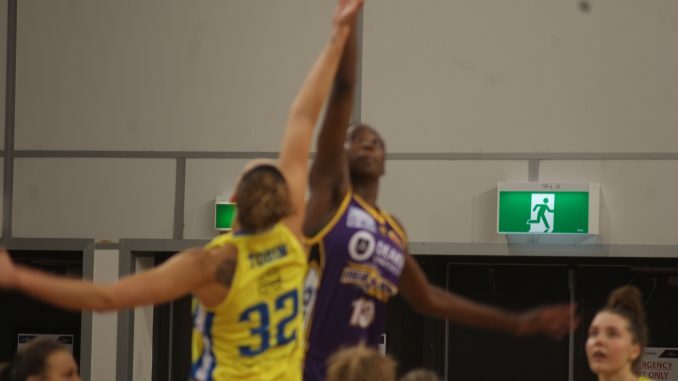 The much-vaunted offence of Lindsay Allen, Jenna O’Hea, Ezi Magbegor and Cayla George clicked, and reeled in a 17 point first quarter deficit. Going up against the University of Canberra Capitals on Friday evening, George’s leadership will be on display, alongside captain Jenna O’Hea, as they shoot for back-to-back wins away from home. The Lynx’s two games this round are against the Spirit, first at home then on the road at Dandenong Stadium against the Rangers. With one win and one loss, the Lynx are evenly poised at the moment, but have a chance to build momentum after defeating the Townsville Fire last week. WNBL Team of the Week nominee Britt McPhee leads the Lynx in scoring with 43 points and 12 rebound, followed by Asia Taylor with 37 points and 13 rebounds. Coach Andy Stewart will be hoping for a repeat from his scoring weapons going into their road trip against the Rangers. A wounded Flames team will head to Townsville to take on the Fire, who also lost last weekend. The Flames hit the scoreboard hard in the first quarter against the Boomers last week, then watched their lead evaporate. Alex Bunton was dominant in that first quarter, looking every bit an early pick for WNBL MVP honours, before a leg injury sidelined her for most of the rest of the game. The defending champions are smarting after being extinguished by the Perth Lynx in their second loss of the season. Suzy Batkovic will attempt to back up after her 23 point performance in Perth, while Ally Malott (9 points, 2 rebounds) and Laurin Mincy (8 points, 6 rebounds) could be called into action off the bench. New Zealand international Stella Beck will make her debut for the Fire after recovering from a stress fracture that kept her sidelined for the first two weeks. Adding the firepower of Beck alongside Batkovic on the offensive end will be a welcome sight for stand-in coach Mark Wrobel. Undefeated and sitting second on the ladder, the Capitals host the Boomers at AIS Arena on Friday evening. Forward Kelsey Griffen, fresh off her 23 point, 14 rebounds performance against the Boomers in Geelong, will look to do it all again. Lauren Scherf will look to back up Griffen again after her 14 points and 6 rebounds in just 26 minutes of court time. Import Kia Nurse is in stellar form and giving Griffen great support, the Canadian native matching Griffen’s 52 points for the season so far.